Efficiency Maine offers incentives for Technical Assistance Studies to those customers that have already identified a project but need additional outside assistance to move it forward. Customers are guided through the process of developing the energy savings analyses and project cost estimates necessary for our Custom Program application. Efficiency Maine may provide up to 50% of the cost of an approved Technical Assistance Study up to $20,000. To review the Technical Assistance guidelines and apply for an incentive, click here. Are you doing a Technical Assistance study for a Distributed Generation project? Click here for the Technical Analysis checklist. For a full list of Efficiency Maine’s approved Technical Assistance providers, click here. 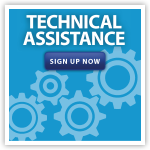 Interested in becoming a Technical Assistance provider? Click here for more information. For more information, review a PDF or a video recording of our recent Technical Assistance training webinar.